Blog - Custom Product Works, Inc. The USB combo receptacle that is used in the TR series is the only one on the market that will fit in the TR. Because of physical USB design, it can only be installed one way with the USB ports to the left side, thus protecting the integrity of the closure. Custom Product Works http://www.customproductworks.com contains all Angled Power Strip products with all features/option selections available. For example, the TR series Angled Power Strip contains 21 optional accessories. Custom Product Works http://www.customproductworks.com contains all Task Lighting product with all features and option selection available. Custom and standard built products are our specialties for the trade and retail customers. For example, the TR series Angled Power Strip contains 21 optional accessories. The center of the knockout for the direct wiring to any of the power strips are located 1 1/2" from the edge with some exceptions. See detail post. Whatever happened to the 60-watt lightbulb? All that is said today is 800 lumens and 2700k – 3000k kelvins. Huh! Angled Power Strips come with 5 variations of outlets, 15 amp, 20 amp, Single Outlets, Duplex Outlets and (Tamper Resistant, Non-tamper Resistant). Depending on your needs, the right combination is available for you to keep your cost as low as possible. A standard cutoff amount is 2" for the Task Lighting LED Closet Rods. Custom Product Works Inc. is adding the availability of the new slim profile Angled Power Strip by Task Lighting (APT Series) product. USB Chargers are available in the TRS series angled power strips. Yes, Task Lighting Products are UL and CUL (Canadian Underwriters Laboratory) listed. UL Listing means that UL has tested representative samples of a product and determined that it meets UL’s requirements. These requirements are often based on UL’s published and nationally recognized Standards for Safety. Are Angled Power Strips Direct Wired? 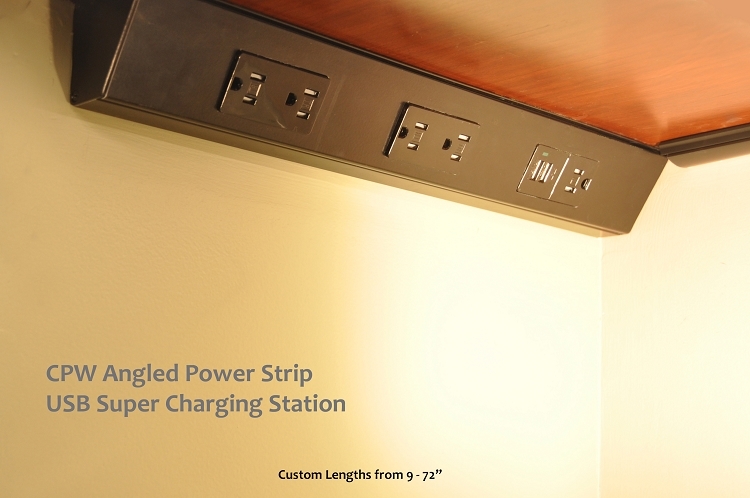 The Angled Power Strips come prewired internally with standard knockouts available on both ends of the strip. Plugin quick connectors are located inside for the connection to making it easy for the installer. Just strip the external wire and plug it in! Do Angled Power Strips have GFI capability? Because of the size constraints of the power strip, a GFI will not fit in the strip. However, there are two ways to take care of this situation. 1) Replace the circuit breaker in the load center with a GFI breaker and that will protect the circuit. 2) Feed the angled power strip from the load side of an outlet with a GFI in it. Focus Industries known for their quality outdoor lighting fixtures to meet the needs of homeowners and commercial applications is now in the process of being made available in the CPW store. Task Lighting acclaimed Angled Power Strips, custom made to customer's needs are made available for purchase with the easy to use configurable web-store. The Angled Power Strips eliminate the need for example kitchen back splash outlets. Numerous optional accessories are available to create access for TV, USB Chargers, or Internet connections.